My first contact with VTClocks was in the early 1970s when I started working at Granada TV's studios in Manchester. Each studio had a VTClock device mounted on a movable trolley. The main part of the clock resembled an open-topped box, about 20" x 15", and about 9" deep. The clock drive mechanism was mounted underneath, so that the clock face itself was inside on the bottom of the box. The whole box was then rotated through about 70 degrees and mounted on a metal (dexion) frame with castors, so that the studio cameras could look slightly down into the box and see the clock inside. (This was the era when captions used Letraset on cardboard and were placed on an easel in front of a studio camera.) The idea of the box was to act like a lens hood and keep out any flares from the big studio lights. The entire assembly was painted black, and there was a small strip-light inside the top edge to provide consistent illumination. The clock face on the left allowed for a 45 second countdown, and the ident area on the right was essentially a blackboard onto which the programme ident information was written with chalk. Video recording at that time used two inch wide tape on open reels, and the machines needed a fifteen second run-up before stable pictures could be guaranteed. This meant that when a programme tape was played for transmission, the tape would have to be started precisely fifteen seconds before the advert break finished. As broadcast VTRs moved from two inch tape down to one inch, and now to half inch cassettes, run-up times decreased accordingly so that instant cues are available now on some machines. On the other hand, tape shuttle speeds have increased, so that having thirty seconds of ident clock at the beginning of a program can still be useful when cueing-up the start of a programme. The sequence of events in the studio during the clock countdown was as follows. The clock would be temporarily re-positioned near to one of the cameras, and the Vision Mixer would switch that camera's output to studio output. When everyone was ready, the PA in the gallery would first "Roll VTR" (which was in another part of the building), wait for confirmation that it was rolling, and then issue the command "Start the clock". This would be relayed via the Floor Manager to a Stagehand who would actually press the switch on the side of the clock (yes, they were mains powered) to start the countdown, usually at 45 seconds. When the clock got down to 25 seconds, the Sound Mixer would send 0dB line-up tone for 5 seconds before fading up a mic on the studio floor, and the Floor Manager would give a verbal ident between 20 and 15 seconds. The clock would then continue counting in vision until a few frames before zero (typically three seconds), at which point the Vision Mixer would fade to black. Meanwhile, if the opening titles were on film (as they often were), the PA would have cued tele-cine at six seconds, at zero seconds the Vision and Sound Mixers would fade up their respective tracks, and the main programme recording would commence. There was very little video editing as such, so if you got ten minutes into a fifteen minute Part One and everything fell apart, then you simply went back to the beginning and started again! These days most programmes are put together in the edit suite. Many programmes are shot single-camera on location, and even those from multi-camera studios are recorded in short segments which require editing together. Rather than use a VTClock for identing each section, most programme makers rely on Timecode to log and identify their source tapes. However, on the edited master tape, the VTClock is still just as useful. When you start to build up an archive of finished programmes, having idents at the start of each tape means you can confirm the contents without having to find the relevant part of the opening titles (which are frequently not right at the start of the programme). As caption cards were replaced by electronic Character Generators, so electro-mechanical VTClocks have been replaced by all-electronic equivalents. The first of these were dedicated electronic units with four figure price tags (still used by many edit suites), but current small computers can perform the same function in a more cost-effective way (as part of a more flexible video/graphics workstation). VTClock software can add VTClock functions to an existing computer for a small fraction of the cost of a dedicated unit. The dedicated electronic clocks were basically similar in function to the old electro-mechanical studio clocks, but with one or two useful new features. The flash-frame at ten seconds is one of those. The main use for it the edit suite is actually in finding the zero second point (which is were you want your programme to start). This is what you do. Lay down your clock (starting at 20 is usually enough these days) and let it run down past zero (until the clockface reappears). Stop tape. Now you want your first edit to be at the point where the clock got down to zero, but you can't see the clock at that point because it's gone to black! So what do you do? Go back to where the clock is still in vision and find an exact number of seconds (ie a frame where the clock hand changes from one second to another). Then zero your tape counter and set your edit for the appropriate number of seconds ahead. The flash frame makes this process easier by marking the ten second transition point more clearly. Just wind back to the flash frame, zero the counter, jog/shuttle forward exactly ten seconds, zero the counter again and mark your first edit-in point. This is another additional feature of electronic VTClocks, along with the ability to store several preset pages. Scratchpad pages offer a simple method for generating text on screen. Why should that be useful when nearly everyone has access to a more fully featured caption generator? The answer is that sometimes you don't need the overhead of those "full features". Sometimes a simple "typewriter" is more appropriate than a "word-processor". One such use I discovered was for identing voice-overs. Although it may sometimes be best to record the V/O after the pictures have been edited, it is often easier to do it the other way around (to make sure the pictures are edited to fit the words!). Whilst you could record the voice onto audio cassette (or even DAT! ), you will probably find that you can edit more accurately from VTR to VTR, so it makes sense to record the V/O onto video tape. If you have a system with HiFi tracks then there will be no appreciable quality loss before you dub onto the linear tracks as part of the main edit. The drawback of editing audio-only is finding where you are on the tape! If you've recorded three takes of a V/O and you only want the final one you've got to listen to the first two to find the third, and then if you shuttle back a bit too fast you're not sure if you've gone back into the second, or all the way back to the first!! Nightmare! The answer? Record your V/Os with Visual Idents. Break the script down into numbered sections and then select a scratchpad page and set-up a line with the programme name and a couple of lines like "V/O section :- 1" and underneath "Take :-". Leave the cursor where the take number will be but don't type anything else yet. Now, when you start to record, type "1" when the first word is spoken, and then a space when they get to the end, or fluff a word and want to restart. Just carry on typing take numbers across the line (e.g. Take :- 1 2 3 4 5) until you're happy with that section, then backspace/delete back to "Take :-", change the section number and continue marking the next set of takes. At the end of this you will have an audio recording in which you can find the start of any take from any section to within a second or two, without having to listen to any audio!! That's what I call useful! The clock can also be useful when duplicating from the master tape. 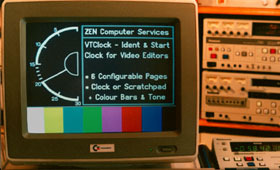 Many VHS machines require a run-up time when initiating recording, and the visual clock is an aid to back-timing the relative cues. As an example, rewind your duplicating machine(s), and run a tape with a 30 sec clock in the master VTR. At 20 secs press Record on the slaves and let them run until the clock hits zero. Then examine the recordings and see what the first frames are. If the first frame shows the clock at 14 secs, then you will need to cue at 6 secs to get the programme to start at the head of the tape. Usually you will need some margin for error, which is why it is a good idea to have the clock go to black a few seconds before zero. If the clock went to black at five seconds, then you could add an extra 3 secs to the previous 6 and press Record at 9 secs with a good chance of coming in cleanly (i.e. not showing the clock, and not chopping off the start of the programme).